The index to the Tallis Street View booklet simply says that Wedgwood & Co produced manifold writers, but the vignette that they had in the booklet proudly has the lettering “R. 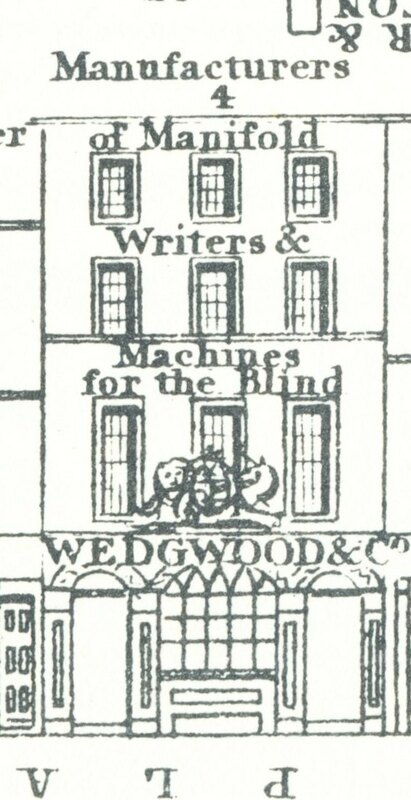 Wedgwood’s improved manifold writers & machines for the blind” on the facade, but just in case you did not realise how important they were, the caption to the vignette tells you that Wedgwood & Co. were the “sole inventors & patentees of the improved manifold writer for copying letters, invoices, &c.” Ralph Wedgewood, of Charles Street, Hampstead Road, had received the patent for his “apparatus for producing duplicates of writing” on 7 October 1806. A specification of the invention can be read in the Repertory of Arts, Manufactures, and Agriculture of September 1807 (online here). It was an early form of carbon copying, a technique that would really only take off in the 1870s when typewriters and an easier way to produce the carbon paper became available. To make the invention usable for the blind, Wedgwood also invented the ‘nocto polograph’ or ‘nocto-graph’ which consisted of a frame to be placed over the paper with guidelines to make sure one kept one’s writing straight. Wedgwood was not the only one to lay claim to the invention of carbon copying. Several competitors alleged that their system was much improved upon the design of Wedgwood, for instance Frederick Bartholomew Folsch, whose system included an ink pen rather than the metal stylus Wedgwood promoted. 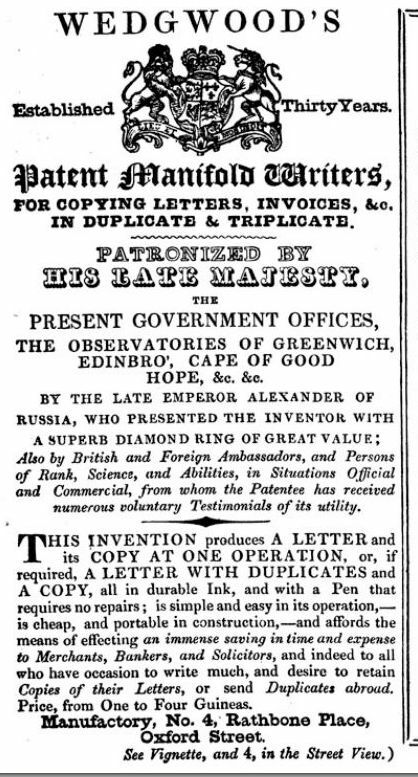 A specification of his invention can be read in the Repertory of Arts, Manufactures, and Agriculture of September 1809 (online here). Folsch and Wedgwood had some sort of economic relationship that is not yet entirely clear. They had neighbouring shops in Oxford Street until 1821 and in some years, the Land Tax records bracketed the properties together despite having different occupants. 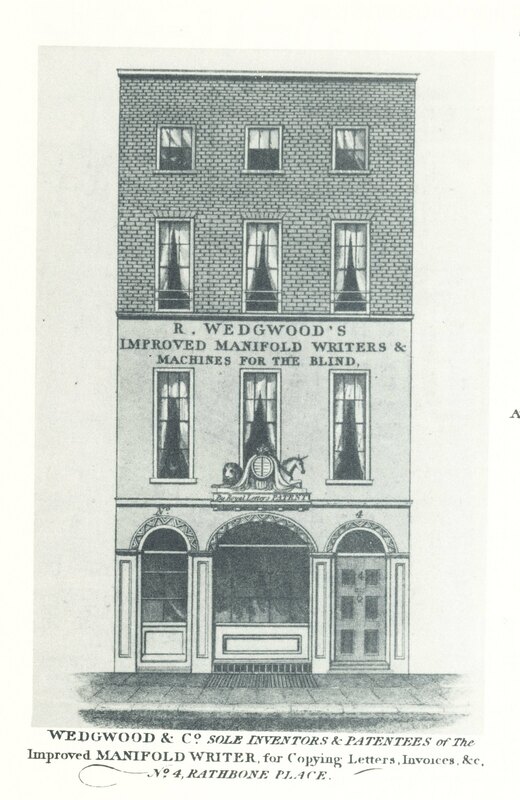 According to the land tax records, Wedgwood moved to a property further up the street in 1821, but they were slightly behind with their administration, as already in 1819, Wedgwood advertised his manifold writer from 345 Oxford Street. Number 327 was henceforth occupied by a Richard Spratson. These changed were no doubt related to the fact that a block of houses around Folsch’s property (numbers 324-329) had been redeemed for the construction of Regent Circus (now called Oxford Circus) and Folsch received compensation for the loss of his premises at both 327 and 328 Oxford Street. (1) The question is, why would he receive compensation in 1816 for both properties? He is never mentioned as having two houses in the Land Tax records. The same question has been asked in the Bodleian Library blog post ‘Copycat Copiers? 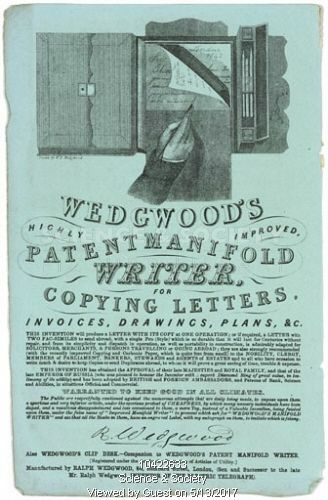 Frederick Folsch, Ralph Wedgwood, and the “Improved Manifold Writer”‘ (see here), but so far, there does not seem to be a logical answer, although the most likely is that Folsch held the lease and Wedgwood rented from him. I recommend you read the Bodleian blog post for all the additional information it gives on the carbon copying invention and the apparent competition between Wedgwood and Folsch. What is clear from the tax records, is that Folsch’s name continued to be listed for number 327, at least till 1850, which is strange, as the houses disappeared and Tallis does not list Folsch or his immediate neighbours; he jumps from house number 325 to 332. From 1827 onwards, Wedgwood was trading from 4 Portland Place, although he seems to have hung onto 345 Oxford Street, at least till 1845, but he does not mention that address in his advertisements. Another confusing thing is that the inventor Ralph had a son Ralph who went into the business. The son was usually distinguished from his father by the addition of ‘junior’ to his name, for instance in the advertisement in The Examiner shown below, but the Land Tax records are silent on this point, so it is unclear whether the son or the father is the occupants of the Oxford Street properties. Ralph senior died in 1837 and after that year, the Land Tax records no longer mention a first name or initial for Wedgwood at Oxford Street, so it is possible that another family member took over the premises. It is, however, clear that it was Ralph junior who occupied 4 Rathbone Place and Ralph junior who was listed in Tallis’s Street View. In 1840, an advertisement for Wedgwood’s manifold writers casually mentions the fact that the partnership between Wedgwood and one Mr. Squire has been dissolved by mutual consent. (3) An ordinary notice, officially recognised by a similar entry in The London Gazette of 1 September 1840, but all was not what it seemed, as there had been trouble between the partners. 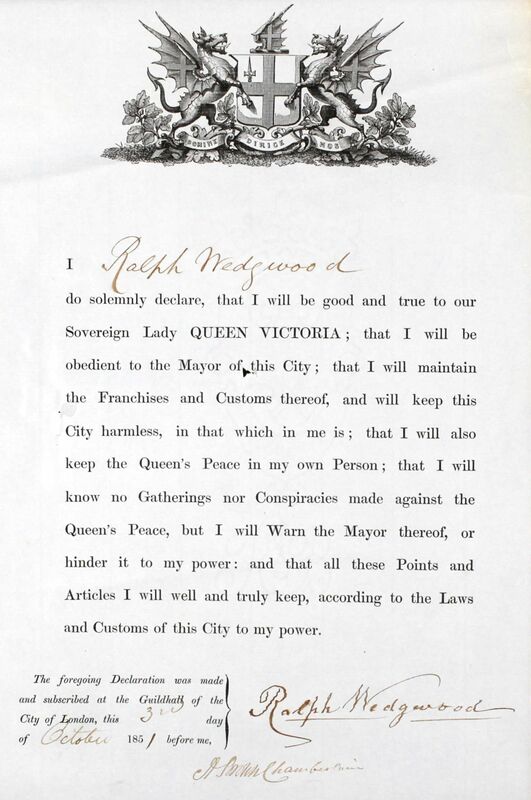 The London Metropolitan Archives list a record, dated September 1840, of the Middlesex Sessions of the Peace in which William Squire, of 18 Furtess Terrace, Kentish Town, and Ralph Wedgwood, of 4 Rathbone Place, are bound over to keep the peace towards each other. I have not seen the documents, so no idea what the argument between the gentlemen was, but it does put a slightly different slant on the phrase ‘by mutual consent’. On 13 January 1841, an advertisement appeared in The Morning Chronicle in which Squire offered “Squire’s manifold writers” from 9 City Road and in which he lists himself as “Squire (late Wedgwood and Squire)”. Apparently he still found it necessary to use the Wedgwood name to underline the quality of ‘his’ product despite the acrimonious parting with his former partner. (1) The Morning Chronicle, 14 September 1816. (2) London Metropolitan Archives, COL/CHD/FR/02/. (3) The Morning Chronicle, 31 August 1840. (4) England & Wales, National Probate Calendar (Index of Wills and Administrations), 1867. One of the executors was his son John Raphael of 9 Cornhill who is described as Manufacturer of Patent Manifold Writers and Writing and Dressing Case Maker. The effects were valued at under £10,000. (5) England & Wales, National Probate Calendar (Index of Wills and Administrations), 1903. His estate was valued at over £110,000.